Suitable for door access not only for small shops and domestic households but also for commercial and industrial applications such as factories, warehouses, laboratories, banks and prisons. 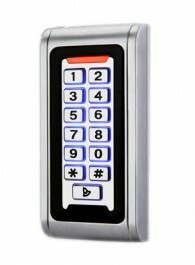 SBR-01CR/MFR is a single door standalone access controller or a Wiegand output 26 bit keypad or card reader. Supports up to 2000 users in either a Card, 4~8 digits PIN, or a Card + PIN option. The inbuilt card reader supports 13.56 MHz frequency cards/tags. cards/tags. It is suitable for mounting either indoor or outdoor in harsh environments. It is housed in a strong, sturdy and vandal proof Zinc Alloy electroplated case.The electronics are fully potted so SBR-01CR/MFR is waterproof and conforms to IP68.